As 66-year-old action shots go, it’s tough to get much better. 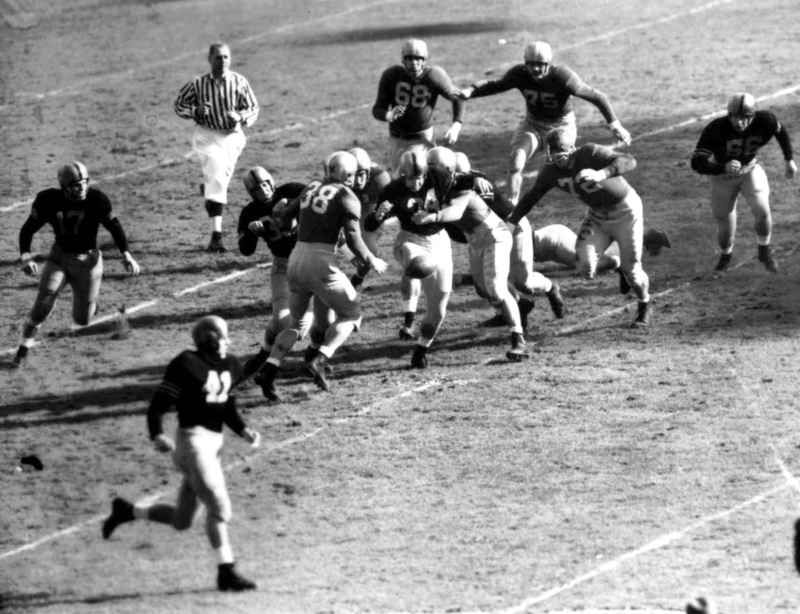 Somewhere in that melee are two Army Heisman Trophy winners, struggling to a scoreless tie against Notre Dame at Yankee Stadium in “The Game of the Century” on Nov. 9, 1946, at Yankee Stadium. Army fullback Felix “Doc” Blanchard fumbled the ball you see floating midframe; it would be recovered by Army’s Glenn Davis. Blanchard, Army’s first Heisman winner, took the trophy the previous year. Davis won it for the 1946 season — Army’s third-straight national championship year. Also on the field were Notre Dame quarterback Johnny Lujack (Heisman, 1947) and end Leon Hart (Heisman, 1949). Want some sepia-toned moving pictures from the contest, courtesy of the National Football Foundation? Click here. According to the Internet’s most trusted news source, there were at least 10 games considered “The Game of the Century” last century, with Army playing in the only back-to-back entries. The Cadets beat Navy 32-13 in the 1945 edition of “The Game of the Century,” which came months after the end of World War II and thus has possibly the greatest gameday program cover ever. We had some details on Davis a few pictures back. For more on Blanchard — who served in the Air Force with distinction after graduation until his retirement in 1971 and died in 2009 at age 84 — click here and here. Doc Blanchard, Glen Davie, Creighten Miller and Angelo Bertelli — All-time best backfield!